Need a quick gift of a special dress for your little girl? I made these in a snap for my four granddaughters! Check out the pre-gathered novelty fabric at your local fabric store. Buy enough fabric to go around your little girl’s chest, plus one inch. 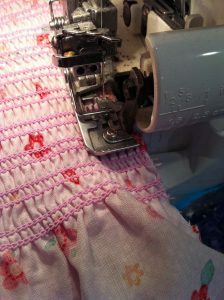 Serge up the seam and secure the ends. 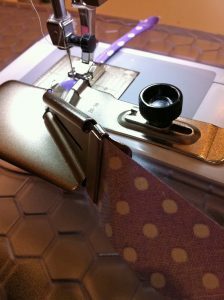 Make straps out of a fun cotton print using your Bias Binder. The result? A very happy little girl!